Today Julianne whipped up a couple of amazing meals…satisfyingly yummiferous!! For breakfast we once again had pumpkin oatmeal with raisins and vanilla. This was great…nothing like pumpkin pie for breakfast! For lunch Julianne used a recipe from the McDougall 10 Day Free Program. 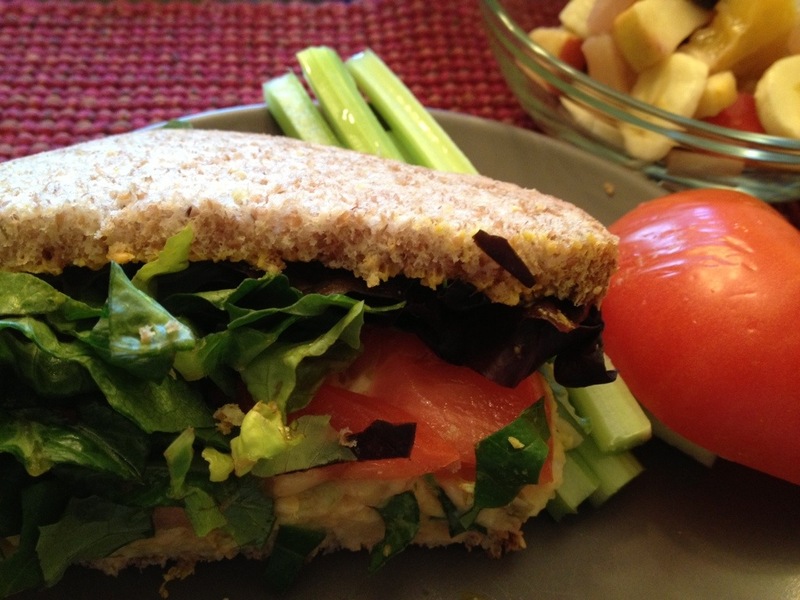 We had savory garbanzo bean sandwiches (see recipe here). The garbanzo beans are mashed and then mixed with fat free mayonnaise, onion, celery and dill relish. 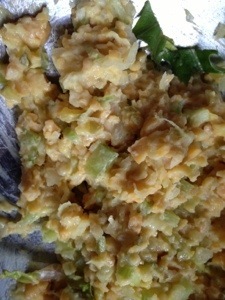 It has the consistency of egg salad and almost tastes like it…but much healthier. This is what the concoction looks like when mixed up. We then put it on Sesame Ezekiel Bread (made by Food for Life Baking Company) which is very low in fat and very tasty. We added mustard, lettuce and tomato on the sandwich. If you like egg salad sandwiches, you will love this!! Between lunch and dinner, we took a trip to Big Lots to get some groceries…yes, that’s right, Big Lots! They carry Bob’s Red Mill grain products, such as steel cut oats, five grain cereal and some bean soups. While there we also got some good deals on Kashi boxed cereal, canned tomatoes, green salsa, jalapeños, and even got 6 gallons of bottled water at $1 each. We loaded up in the grain cereals as they are healthy, low fat and full of carbs and fiber. We spent less than $100 and are really stocked up!! This evening, we had Veggie Soft Tacos using up many of our leftovers from the last couple of days. We used corn tortillas that had no fat. We added chopped veggies, corn, potatoes and avocado, then topped off with green salsa we picked up at Big Lots. We also had lettuce and tomatoes. 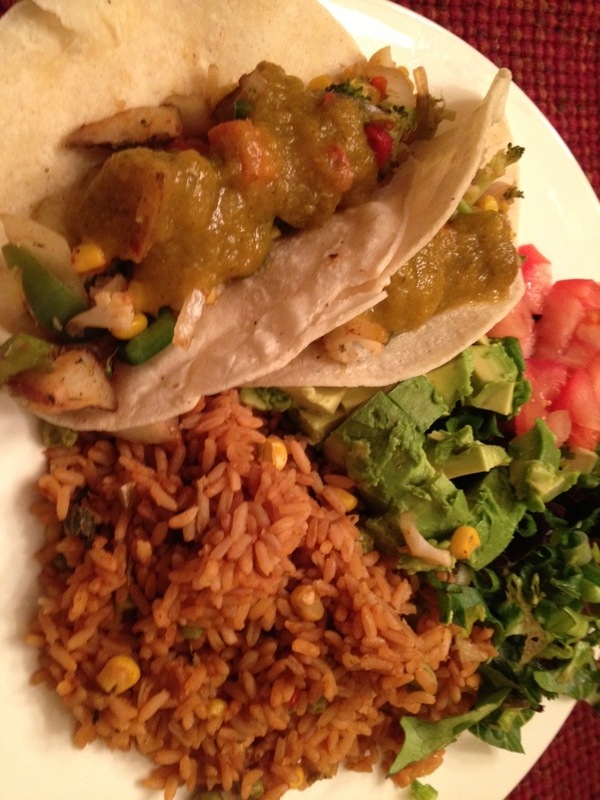 We also had a side of Spanish Rice which i also doused with that yummy green salsa. It was glorious!! I must be honest. I feel like I am eating like a king folks. Do I miss cheese…well, yes, I still do. But these foods are so tasty, filling and healthy that I don’t really crave the big block of yellow greasy dairy stuff like I used to. I can do without it.